Heat water and peas to boiling in 3-quart saucepan. Boil 2 minutes; reduce heat. Cover and simmer until peas are tender, 50 to 60 minutes; drain. 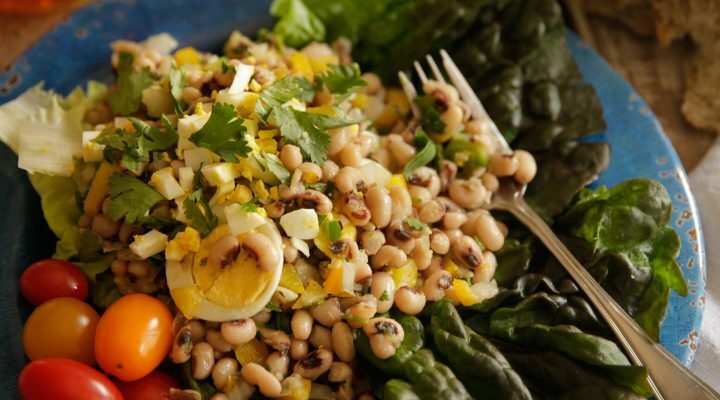 In large bowl, mix cooked peas and remaining ingredients (except 1 hard-boiled egg). Cover and refrigerate 3 hours. Arrange remaining sliced egg on top of mixture; sprinkle with additional cilantro and serve. A one-pound package of Camellia Brand dry beans yields about five to six cups of cooked beans, drained.